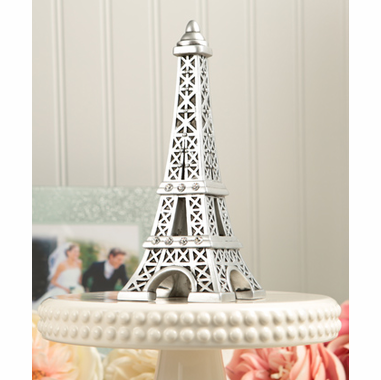 Pardonne moi, Madame...are you seeking Eiffel Tower party decorations? 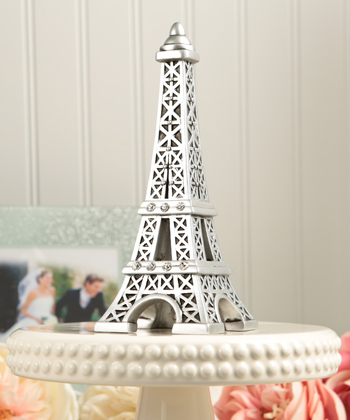 Oui, our Paris centerpiece is c'est magnifique for bridal showers, Sweet 16 parties and theme proms! Put some "Oohlala" on your tables with this detailed replica of the iconic landmark symbolic of love, romance and whimsy. Each tower is crafted from poly-resin to reflect the intricate design from the girders to the soaring heights of the tower. The tower measures 8"Hx3"Hx3"D, so it's just the right height for a table centerpiece but would also look tres chic as a cake topper. They ship in a coordinating in a grey box which also has the Eiffel Tower design. They are cast in an antiqued pewter tone with sparkling rhinestone accents.